Scientists isolated paclitaxel, one of the mostly widely used anti-cancer compounds from the bark of the Pacific yew tree in the 1960s. However, it wasn’t until the 1980s that the drug Taxol® was fully developed under the terms of a Cooperative Research and Development Agreement (CRADA) between the National Cancer Institute (NCI) and Bristol-Myers Squibb. Paclitaxel possesses an unusual mechanism of action: it targets a cell’s microtubules, binding to the microtubule assembly, blocking the segregation of chromosomes and slowing cell division and growth. Although drug supply issues slowed initial development, NCI conducted pre-clinical testing on paclitaxel and phase 1 and 2 clinical trials in 1984 and 1985. Under the terms of a CRADA in 1988, Bristol-Myers Squibb was responsible for future production of paclitaxel for clinical trials. 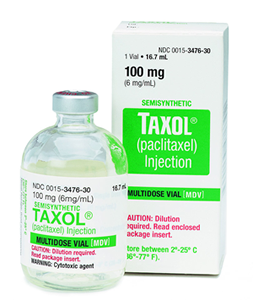 Using Taxol semi-synthesis technology licensed from Florida State University, the pharmaceutical company was able to develop a synthetic form of paclitaxel, Taxol®, and produce sufficient drug supply. Over the course of the CRADA, the number of patients enrolled in NIH clinical trials of paclitaxel rose from 500 patients in 1989 to nearly 29,000 in 1998. Bristol-Myers Squibb received approval from the FDA for paclitaxel to be used in the treatment of ovarian cancer in 1992, and for advanced breast cancer in 1994. Taxol® has been used to treat patients with lung, bladder, prostate, melanoma and esophageal cancer, and Kaposi’s sarcoma. Since its first approval, over 1 million patients received treatment with Taxol® (paclitaxel). Several analogs of paclitaxel have been commercialized and are significant cancer therapeutics. As of February 2016, there were hundreds of open clinical studies that included paclitaxel.